The BAUERs Hotel is a luxury, five-star property located in magical Venice, Italy. This amazing hotel features an art-deco style and is one of the most luxurious hotels found anywhere in the world. In February, The BAUERS will present its fourth annual Carnival event. It’s a tribute to La Marchesa Luisa Casati, the eccentric Italian heiress of the early 20th-century. Casati inspired numerous, Italian artists including Boccioni, Marinetti and D’Annunzio. The Carnival event will be held starting Saturday February 7th and runs through Saturday, February 14th, 2015. This special occasion will be at The BAUERs Hotel’s Grand Canal Terrace. The fourth edition of the Venetion Carnival will be a memorable night of incredible theatrical performances, led by famous Maestro De Luigi. Enjoy authentic music, dance and great tasting food. 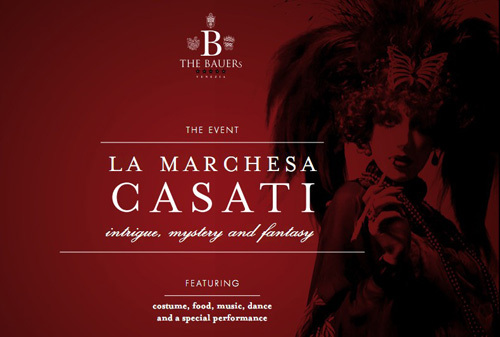 La Marchesa Luisa Casati was once quoted “I want to be a living work of art.” The Venetion Carnival at the The BAUERs Hotel hopes to bring her visionary spirit to life. You can experience parcours through the city of Venice tha is also being professionally filmed as a short movie. This is a wonderful idea for a spectacular souvenir of your stay. Of course you will want to immerse yourself and dress in costume. If you have never stayed at The BAUERs Il Palazzo, you must. This oppulant boutique hotel offers its guests an unforgettable experience. Enjoy five star luxury service and amenities, surrounded by the culture and beauty of romantic Venice. Pricing for a stay at The BAUERs begin at 650 euros per night. If you would like to visit Venice, Italy and stay at The BAUERs Il Palazzo luxury hotel, please contact The Life of Luxury. Read about other luxury travel packages by following our luxury blog.